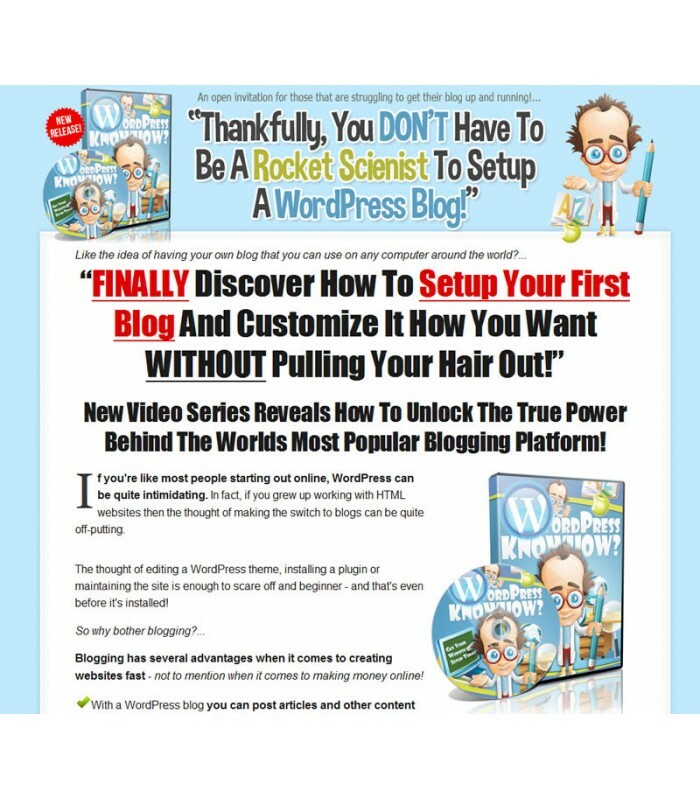 FINALLY Discover How To Setup Your First Blog And Customize It How You Want WITHOUT Pulling Your Hair Out! new video series reveals how to unlock the true power behind the worlds most popular blogging platform! • In this 6:17 video, you will listen to steps required to installing WordPress. • How to log into your cPanel at your hosting site and follow the directions to reach Fantastico. • Continue following the directions inside Fantastico, take note of safety concerns, and finalize the installation. • In this 5:28 video, find out more about the different customization options available in WordPress. • How to navigate your way through WordPress and mange several options that’ll you’ll need to use often. • Continue to save your changes and learn more about the separate boxes used for customization. • In this 4:20 video, you will find out more about the advantages to adding pictures to your website. • How to navigate to your WordPress Dashboard and visit the Pages tab. • Get directions for choosing the Media Upload option and learn how to navigate through your computer’s HDD to select individual images to upload, display, and add options such as text. • In this 4:49 video, you will learn the difference between a page and a post. • Learn and listen to the definition of a page, and then watch how a page is created in WordPress. • Find out more about a post, which is an individual message that appears on a page. • In this 3:26 video, find out more about how to jazz up your page with bolding and italics. • How to navigate your dashboard within pages. Watch as options are discussed for different formatting. • Follow directions for submitting your changes and check to make sure they have worked. • In this 3:33 video, discover how to insert hyperlink texts into your content. • Follow directions for how to use the hyperlink button as well as the various options associated with the button. • In this 4:40 video, you will discover more about WordPress themes, which are design-structures used to customize a website’s appearance. • How to navigate to your Dashboard and click on Appearance. • Learn how to browse through themes, install them, and activate. • Listen to effective means for finding free WordPress themes. • In this 5:16 video, you will listen to and learn about the advantages of plugins for WordPress. • How to navigate to the Plugins page search for plugins. • Listen to instructions for installing and activating plugins for WordPress. • In this 2:09 video, discover how to insert a YouTube video onto your website. • Why you should copy a video’s URL and paste the link into your WordPress page’s text for better performance. • Listen to instructions for how to find embedding code that can be inserted into HTML code, as an alternative to a direct link. • In this 4:14 video, discover how to manage post and discussion submissions. • How to determine whether or not you want people to post comments. • How to navigate your way through the discussion settings to different options associated with post submission. • In this 4:38 video, you will learn about how to edit and customize the menus, or menu, in your WordPress site. • How to navigate to your WordPress Dashboard, to the menu section. • Listen to instructions for how to create a menu, customize buttons in the menu, rearrange the order of the buttons in the menu, and more. • In this 2:52 video, learn more about changing the appearance of your website’s sidebar. • Listen to directions for how to select and remove different categories that appear in your sidebar. • In this 2:57 video, you will follow step-by-step instructions for adding an entirely new user to edit, create, or manage content on your webpage. • Follow the instructions and listen to the various user-options available for a new user. • In this 3:18 video, you will be shown how to use different categories to separate information so that it can be easily navigated. • How to navigate to your dashboard, to add/remove/delete caterogies for SEO optimization and post organization. • Follow instructions for how to create and edit a new category. • In this 3:33 video, you will learn more about links to different blogs, called blogrolls. • How to navigate to your dashboard to modify your blogroll links. • Follow directions for deleting unwanted blogs, adding new blogs, describing blogs, and tagging blogs that appear in your blogroll. • In this 5:16 video, learn more about securing your website from online piracy. • How to find and install a suitable security plugin. • Allow the plugin to make necessary changes to your WordPress site, and follow on-screen instructions to complete installation. • In this 2:19 video, visit a Strong Password Generator and learn the attributes of a good password. • How to generate a strong password without thinking about it! • Follow directions to change the password on your WordPress website by entering the Security tab. • In this 3:30 video, find out more about permalink settings. • Listen to why custom structure is the best option for attracting attention from search engines. • Follow steps to save your changes and adjust settings to be appropriate for a pre-launch website.